Your old family photos probably dust and scratches on them, or they may have yellowed from age. In other photos in your family album, the shadows maybe have become shallow, making the images look faded and flat. 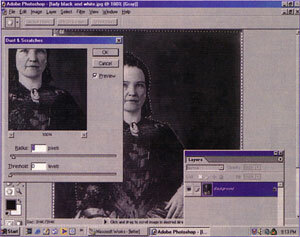 In your ancestor's day, the only way to fix battered pictures was to take them to an expensive photo retoucher. With today's computer technology and a little practice, however, even amateurs can scan and repair old family photos, printing out new copies that look as good as the day the pictures were snapped. 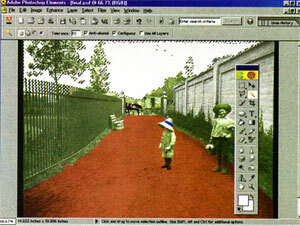 Most people think of programs such as Photoshop and Photoshop Elements, both created by Adobe www.adobe.com, as tools for working with color images. But these powerful programs can come to the rescue of your old black-and-white photos, too. Their tools let you sharpen a scanned image, open up shadows, "clone" areas, "visually repair" torn or damaged photos, blur and even colorize black-and-white pictures. Best of all, you can experiment without risking further damage to your precious originals. 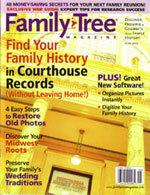 You'll need a scanner to get a digital version of your damaged photo into your computer (see the April 2002 Family Tree Magazine for a guide to affordable scanners). You'll need a computer, of course—both Photoshop and its inexpensive sibling Photoshop Elements work on Macs as well as PCs. And you'll need a printer to share your retouched image with the rest of the family. Once you're equipped, try these tricks. 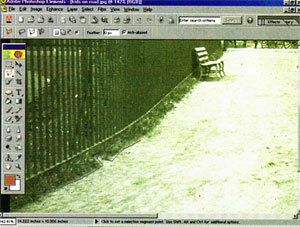 The easiest way to get rid of scratches on your scanned photo is to use the Dust & Scratches tool, found in the Noise group under Filter. This actually blurs the image a little, getting rid of the scratches and dust that may have accumulated on the photos. 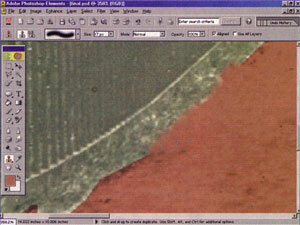 After the Dust & Scratches tool, try using the Unsharp Mask tool. It sharpens the image so it's not as blurry. Another way to eliminate dust and scratches on old photos is to use the Clone tool (it looks like a rubber stamp). After selecting the Clone tool, hold down the Alt key (option key on a Mac) and click in an area that's similar to what you'd want to see in place of the dust or scratch mark. Then just click the damaged area of your photo to "clone" the good area onto the bad. This is also useful in touching up blemishes on people's faces in photos; simply clone an unblemished area onto the blemish. These three related fixes work best for targeted touchups. When you select the entire image rather than a single damaged area, they tend to soften the picture--sometimes, more than you'd like. That leads us to method 2, which takes longer and requires the full Photoshop program, but the end result is much better. For this method, first select the Dust & Scratches tool, and more the tool slider to the left. Then move Radius and Threshold to the right until the dust or scratches are removed (the slightly blurry effect is OK; we'll fix that). Now select the History window and click on Take New Snapshot (not available in Photoshop Elements). This will save your cleaned-up photo as Snapshot 1. Next, select Edit, then Undo Dust & Scratches--that puts your picture back to where you started. Select the History Brush tool and click on the little box to the left of Snapshot 1 in the History window. Then, select the blending mode on the toolbar. If you have dark spots on a light background, choose lighten; to fix light spots on a dark background, choose darken. Select the brush size, and then brush over the spots where the dust or scratches were. Many Photoshop and Photoshop Elements users think that "colorizing" a photo means just painting over it with the Paint Brush tool. But the texture of the underlying area gets lost when the Paint Brush lays down only a selected color, leading to a two-dimensional appearance when the intended look is three-dimensional. Here's a better way. The first step in colorizing an old black-and-white picture you've scanned in shades of gray ("grayscale") is to convert it to the RGB format (short for Red-Green-Blue). Simply click on Image, then hover over Mode and select RGB. Now select an area that you want to change to a specific color--your Civil War ancestor's blue Union cap, for example. Select the area with the Lasso tool; if it's a definite shape such as a circle or square, use the regular selection tools. Next, in Photoshop Elements, select Enhance, then Adjust Color, then Hue/Saturation. (In Photoshop, it's Image, then Adjustments, then Hue/Saturation.) When you click on the Colorize box, the selected area gets automatically colored--no painting required. You can adjust the levels of hue, saturation and lightness by clicking and dragging on the adjustment toggles or by typing in a number in the number field. Another way to colorize an old black-and-white photograph is to use the Variations command. The first step is to select the area just as in the previous method, but instead of using the Image Enhancement feature, select Image, then Variations. From the Variations box, you can make the area more of a certain color, such as more yellow, more red and so forth. 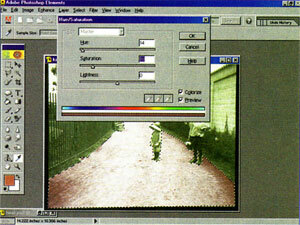 The shadows, midtones, highlights and saturation can all be adjusted on the toolbar. With a little practice, you can make copies of your old family photos that look as good as new--or better. Before you know it, you'll be Photoshopping out that black sheep in the family and updating your geeky clothes in your own high school snapshots. To colorize a black-and-white photo, first draw a selection along an area to be colored. Click on the Colorize box to give the area a desired hue. You can adjust the hue, saturation and lightness levels. The next step is to select the sky, either by tracing it with the Lasso tool or, as in this case, clicking the area with the Magic Wand to select it all at once. You may find some spots in areas that haven't been colorized yet, such as the bright yellow ones here. To erase these spots, use the Clone tool. After selecting the Clone tool, hold down the Alt key (option on Macs) to capture an area, and then click in your target--this pastes the original content into the new area and smoothes borders. 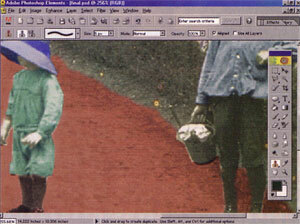 Photoshop's tools make it easy to erase the effects of time. The Dust & Scratches effect actually blurs the image to hide scratches. Radius refers to how big the blur is, and Threshold refers to when it starts to apply to the image.